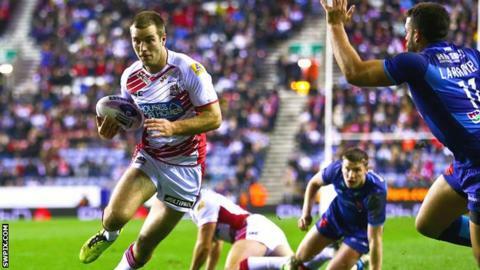 Wigan Warriors could be without Iain Thornley for the rest of the season as he needs a shoulder operation. The 22-year-old, who can play at centre or on the wing, tore a pectoral muscle in the win over St Helens on 18 April. In addition, props Ben Flower (ankle) and Eddy Pettybourne (calf) will miss six and two weeks respectively with injuries suffered in the same match. "Losing two front-rowers for a decent amount of time is a blow but we have to deal with it," said coach Shaun Wane. Wigan are already without England international Josh Charnley because of a knee problem. Thornley, who returned to the Warriors in 2012 after a spell playing rugby union for Sale Sharks, started the season in prolific form, scoring seven tries in his first seven Super League outings. He was also a try scorer in Wigan's Challenge Cup final win over Hull FC at Wembley last August. Wane's side host Hunslet Hawks in the fifth round of the competition on Sunday.